Jeff and Shari Ungerleider cuddle their first child, Evan. Born with Tay-Sachs disease, Evan died at age 4. Jewish Genetic Diseases Center of Greater Phoenix holds periodic community genetic screenings open to all Jews, any person with a Jewish background or a Jewish partner. 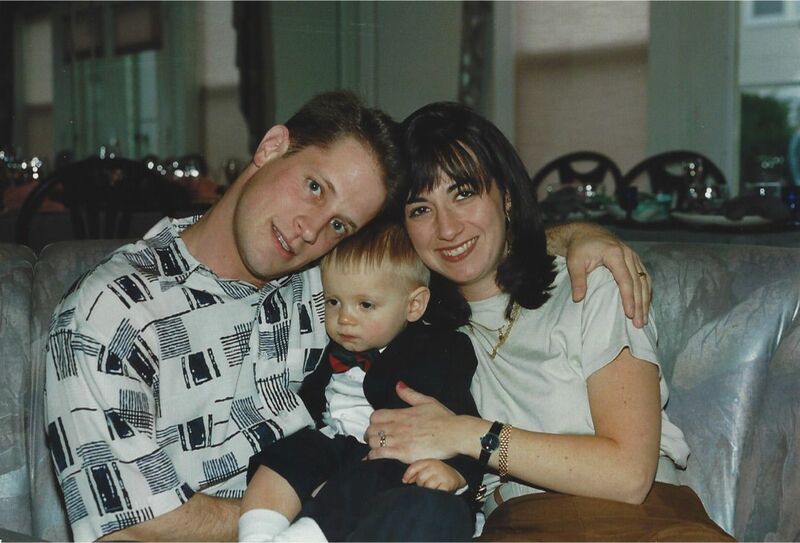 Like many Jews, Shari Ungerleider was tested for Tay-Sachs disease while she was pregnant with her first child, Evan. Tragically, the results were misread and Ungerleider was assured she wasn’t a carrier. “By the time Evan was about 10 months old, we knew that something was wrong,” she said. Evan was not developing at a normal pace compared to other children. It wasn’t until Ungerleider took him to an optometrist that a distinctive red mark in his retina was discovered. Evan died at age 4. September is National Tay-Sachs Awareness Month and Jewish organizations in the Valley and around the nation are urging the Jewish community to get screened. Ungerleider of Wayne, New Jersey, turned her personal tragedy into positive action and is now the project coordinator of the Jewish Genetic Disease Consortium based in Pomona, New York. Like Carriere, she is working to make sure everyone gets tested and is educated about the disease. Tay-Sachs is caused by a lack of the enzyme known as Hexosaminidase A (Hex-A). Hex-A’s function is to help break down a lipid called GM2 ganglioside. Without Hex-A, GM2 builds up abnormally in cells, particularly brain and nerve cells. This accumulation causes continual damage to the cells. Staff and volunteers from JGDC, the consortium and other organizations such as JScreen offer educational events and lectures nationwide to emphasize the importance of genetic screening and provide options on how to proceed if a person is a carrier. JScreen Director of National Outreach Hillary Kener described the likelihood of passing Tay-Sachs to future generations. “If both parents happen to be Tay-Sachs carriers, there is a 25 percent chance that each pregnancy will be affected with the condition,” Kener said. Tay-Sachs has three different categories: infantile, juvenile and late onset. Juvenile Tay-Sachs, while rarer, has similar symptoms that appear later in life. Children diagnosed with it may start seeing neurological dysfunction at ages 2 or 3. Late onset Tay-Sachs is usually not fatal but it can lead to cognitive and physical decline, and even psychosis. Currently there is no cure for Tay-Sachs. But that does not mean that carriers of the genetic condition are without options. Ungerleider and her husband, Jeff, raised three healthy children after Evan’s death. The JGDC will host its next public screening at Arizona State University on Jan. 27, 2019, and then a second one at the University of Arizona on March 24, 2019. “The JGDC provides free or highly subsidized screening for Jews and their partners,” Carriere said. “We provide testing to anyone within the ages of 18 to 45 that has any Jewish background or a Jewish partner and is planning to have children. For more information, visit Jewish Genetic Diseases Center of Greater Phoenix at jgdcaz.org.